The CPSE ETF NFO was launched in March 2014, and JainMatrix Investments had evaluated this offer and rated it a BUY. See this report – LINK. See post NFO note – LINK. We now review this ETF for its performance so far and evaluate it as an investment today. 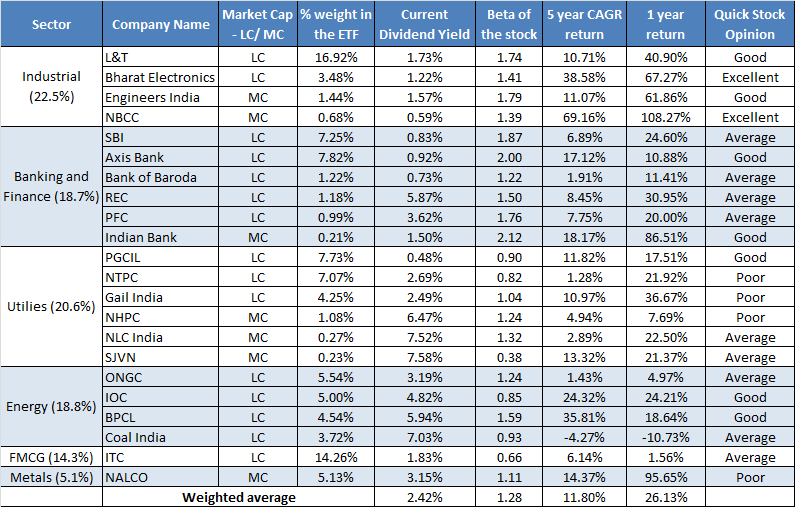 The ten CPSE ETF firms are well known, high dividend, asset rich Indian PSUs’. Investors have got a return of 27% (absolute) and 18.8% (annualized) in 17 months. The prospects of the ETF firms look good. The govt. is executing on long pending structural reforms such as oil prices decontrol, subsidy reduction, power sector refocus, etc. On the whole, the CPSE ETF firms are expected to perform well. The 20% fall in the last 45 days gives investors an opportunity to enter at better value. BUY the CPSE ETF with a minimum 1 year perspective. The Central Public Sector Enterprises ETF Index was started to help the GoI disinvestment. The Fund Manager, Goldman Sachs listed the CPSE ETF in a New Fund Offer on 4th April 2014. The ten firms included in this ETF are well known, high dividend, asset rich Indian PSUs’. We can see from the Price history of CPSE ETF, Fig 2, that within 2 months of launch, it hit its high of Rs 27.95. It was steady at 24+ levels till early Aug 2015, but has fallen almost 20% to 20.8 today. Now here is a look at the ETF performance since the NFO listing. Investors have got a return of 27% (absolute) and 18.8% (annualized) on the ETF. Fig 3. Being an ETF, this fund invests in and tracks a weighted average of share prices of the stocks listed in Fig 4. In addition, we capture the share price gains and dividend over 6.5 years. JainMatrix Investments had pegged an expectation of 24% from this ETF for the first year. This was achieved, but in the last 2 months, the ETF NAV fell due to the to the Coal India, ONGC and GAIL shares fall. The GoI is making efforts to energize these firms to achieve production & revenue targets that will achieve national objectives. This will benefits investors also. Many of these firms own wonderful assets, the family silver of the Govt of India. These firms may also enjoy monopoly status, and may be the implementation arms for govt. initiatives. We can see that the GoI is in the process of dismantling the Administered Price Mechanism in Oil & Gas, and allowing Coal India, ONGC, etc to truly work freely without govt constraints and subsidy systems. If this is done, the massive assets and value of these firms can be unlocked. The CPSE ETF has a low management charge at 0.49% as the stocks and weightage is fixed. The weighted average share price appreciation over last 6.5 years is 11.8% for the firms. See Fig 4. This of course can vary widely from year to year. Dividend yield for these stocks is 3.67%. Tax benefits: Individual resident investors would gain from nil tax on Long term capital gains, which kicks in at 12 months for this equity oriented fund. The ETF is dominated by the Oil & Gas, Power and Coal sector, where we have seen in the last one year a rapid fall in global commodity prices. This has affected the ETF performance. This fund is Oil & Gas heavy with a 60% weight. If one extends the description to Energy Sector with Coal, Power, Oil & Gas and related financing, it increases to 92%. This is a high sector risk. The GoI is in the process of disinvestment in PSUs, including some of the CPSE firms. This typically lowers share prices in the short term, till this process is complete. There is also talk of a second CPSE fund. Decontrol of prices in petrol /diesel sector has affected Oil E&P while benefiting OMC firms. Power sector reforms are crucial for financial improvement and debt reduction. This has started, but even so the power sector financial firms may see uneven performance. Most of these stocks are asset heavy and resource rich firms. Their performance depends upon revenue growth, which has slowed down in recent years. Another sharp fall in global oil prices can again depress the CPSE ETF performance. There has been a massive fall in Oil prices globally. However now, it does not appear that there will be a further sharp fall. Thus ONGC share should not fall much further. Coal India and GAIL disinvestments should be complete in the next 3 months. The prospects of the ETF firms post the above events look good. The government is cleaning up on long pending issues with structural reforms such as oil prices decontrol, subsidy reduction, etc. Coal India performance (with Railways support) has improved of late. They are tasked with utilization of massive coal deposits and good supply which will reduce the need to import coal and waste forex. On the whole, the CPSE ETF firms are expected to perform well. This document has been prepared by JainMatrix Investments Bangalore (JM), and is meant for use by the recipient only as information and is not for circulation. This document is not to be reported or copied or made available to others without prior permission of JM. It should not be considered or taken as an offer to sell or a solicitation to buy or sell any security. The information contained in this report has been obtained from sources that are considered to be reliable. However, JM has not independently verified the accuracy or completeness of the same. Punit Jain has a small retail investor holding in CPSE ETF since NFO. He also has small holdings in the firms CIL, IOCL and EIL mentioned in this report. Neither JM nor any of its affiliates, its directors or its employees accepts any responsibility of whatsoever nature for the information, statements and opinion given, made available or expressed herein or for any omission therein. Recipients of this report should be aware that past performance is not necessarily a guide to future performance and value of investments can go down as well. The suitability or otherwise of any investments will depend upon the recipient’s particular circumstances and, in case of doubt, advice should be sought from an independent expert/advisor. JM has been publishing equity research reports since Nov 2012. JM has applied for certification under SEBI (Research Analysts) Regulations, 2014. Any questions should be directed to the director of JainMatrix Investments at punit.jain@jainmatrix.com. The CPSE ETF offering was successful and oversubscribed as applications were for Rs 4,400 crore when the offer was limited to Rs 3,000 cr. The ETF units were allocated to subscribers at a price of Rs 17.45. NFO investors got allotment by a formula – investor who applied for more than 5000 units got a guaranteed allotment worth 5,000 units. The balance units were allotted to all applicants on a proportionate basis, as per reports. Retail investors who applied for Rs 2 lakhs worth got refunded about Rs 45,700 and got about 8,800 units. Trading of this ETF started on the exchange today and it appreciated by 10.9%. So this Retail investor has gained Rs 16,700 from this NFO purchase already. This is a great start for investors !! As mentioned in my initial report, investors need to hold on to this ETF for 1 year to gain the Loyalty units. In addition, holding for over one year allows for dividend benefits as well as taxation gains. Here is a note on the Central Public Sector Enterprises – Exchange Traded Scheme – NFO. CPSE Index will facilitate GoI’s (Govt of India) initiative to dis-invest some of its stake in CPSEs through the ETF route. Already in the first 3 days of Offer, the fund has collected Rs 2400 crore of the Rs 3000 cr targets.